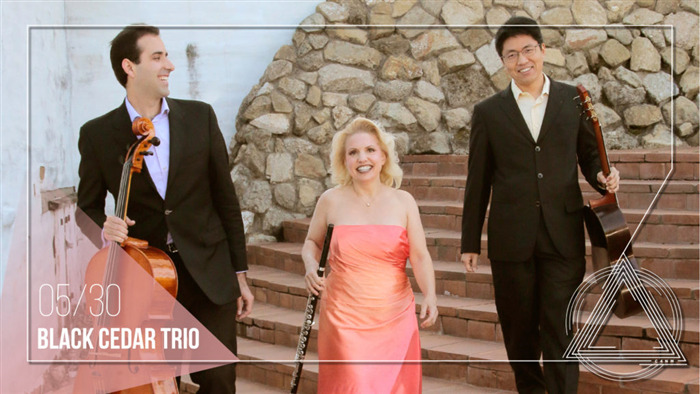 The Black Cedar Trio brings their quest to create a new genre of chamber music for flute, cello, and guitar to the San Francisco Center for New Music. They will present three new works for their unique combination: “Tres Colores” by Chilean composer Javier Contreras, “In The Spring” by San Jose composer Andre Gueziec, and “Out of Nothing” by Minnesota composer Victoria Malawey, all commissioned by Black Cedar in 2018. San Francisco Classical Voice says, “Black Cedar forges a new repertoire with flair. They are not only willing but also quite capable of pursuing ‘a Path Less Trod.’ Audiences will be fortunate for the opportunity to hear live performances as these three musicians pave their own unique road.” With Kris Palmer on flute, Isaac Pastor-Chermak on cello, and Steven Lin on guitar, the Black Cedar Trio is the recipient of multiple grants from InterMusic SF and the Zellerbach Family Foundation.